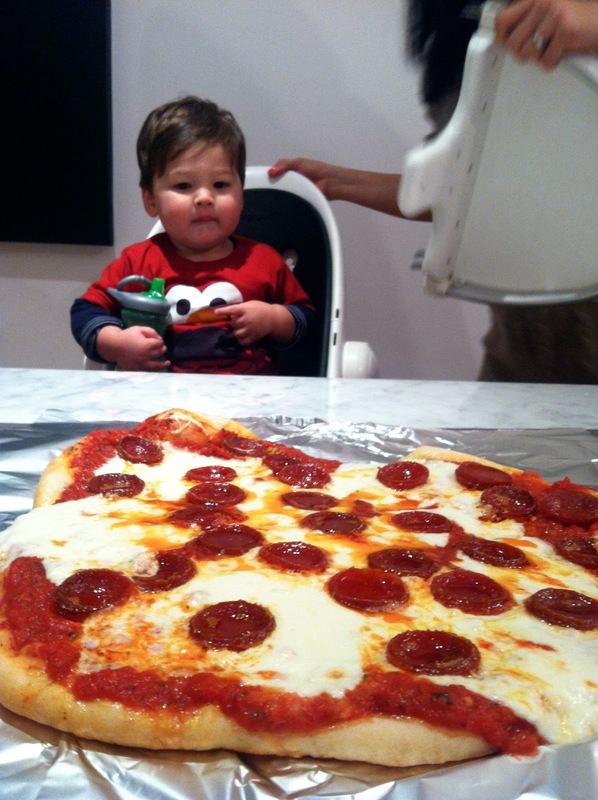 New York City Family: How to Make a 20 Minute NYC Pizza...Faster than Delivery! 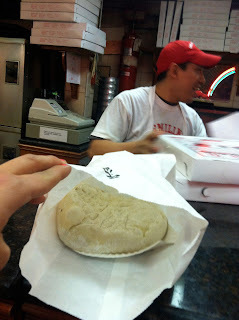 How to Make a 20 Minute NYC Pizza...Faster than Delivery! We sometimes have pizzas delivered, but we're often disappointed. Maybe we just haven't found that place that we love since moving into our current apartment seven months ago. An alternative is making pizza yourself, which can involve quite a bit of time and effort when you're dealing with a dough that needs to rest overnight, etc. And pizza is often something I crave and want the same day. 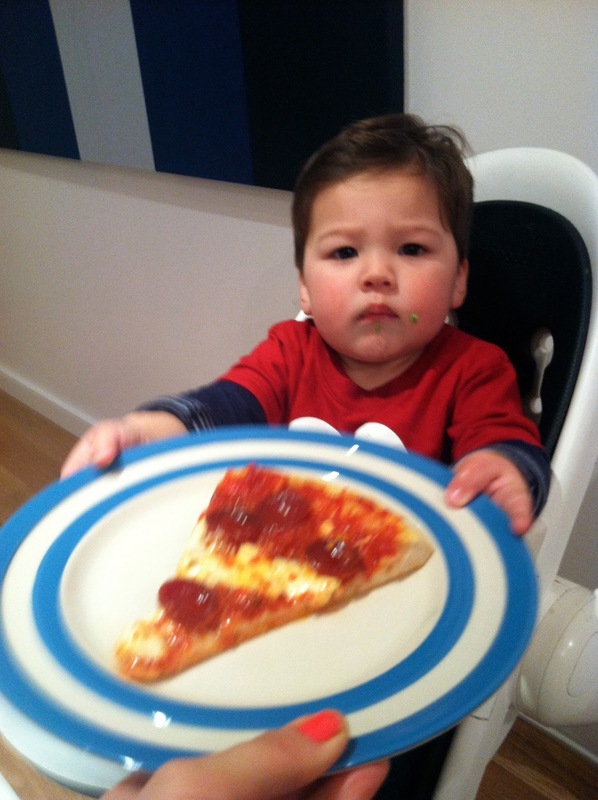 I thought there must be a way to have good pizza with very minimal effort. Pizza doesn't have to be time-consuming, right? So, I went searching for the fastest way to making a good pizza at home. I reached out to Adam Kuban, the pizza expert and sort-of former pizza blogger for his suggestions and then sort of winged the other stuff. 2. Buy a can of Scalfani crushed tomatoes for about $1.99. Adam recommended the quick recipe that appears on this page to me when I said I wanted something fast and good. 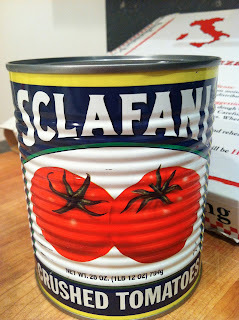 The sauce is just Scalfani tomatoes, dried oregano, dried basil and garlic. You probably have the herbs and garlic at home...this sauce couldn't be faster! 3. Buy whatever toppings you like. I got some fresh mozzarella and pepperoni. 5. When the oven is ready, pull out the stone and put it on top of your oven, making sure it doesn't wobble around. Put the rolled out dough on the stone and carefully shape it, making sure not to touch the stone. Put the sauce and toppings on the dough that's on the hot pizza stone. (I don't know if this is how you're "supposed to" do it, but it's how I do it.) I realized after my pizzas were done that I put too much sauce and cheese, so my final pizzas were a little on the wet side. Still good enough for me, but next time I'll remember Adam's tip: "What looks like too little raw usually ends up being just enough. What looks like enough is often too much." Too much cheese and sauce and not enough time in the oven! 6. 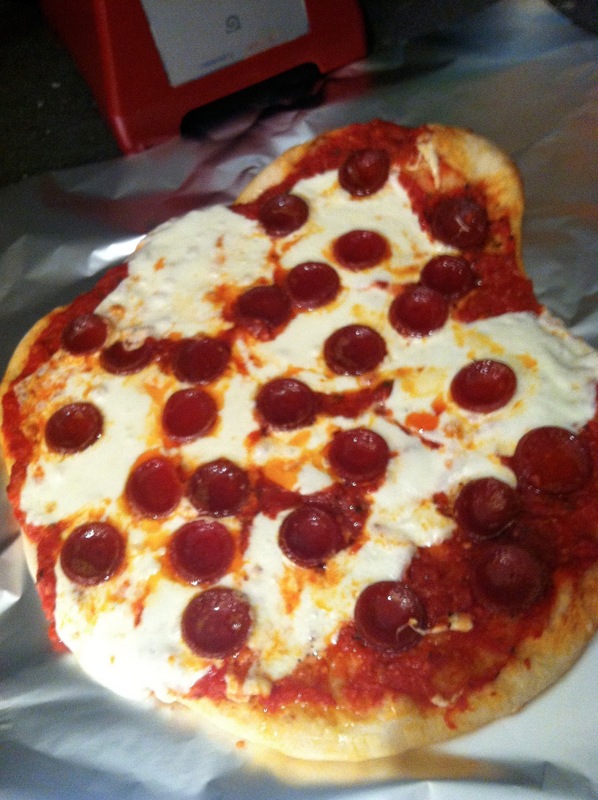 Leave the pizzas in the oven for about 10-12 minutes or until crust is well browned. I didn't leave my first pizza in long enough, but I got it right the second time. 7. Let the pizzas rest for a few minutes (they are way too hot right out of the oven), slice and enjoy! In the end, you will have made a good pizza with very little effort and clean up. I'm excited to work on this lazy man's pizza and get it down to where it's lightning fast and really good. Ideally you'd leave the stone in the oven, after having preheated it for 45 minutes to an hour. Meanwhile, get out a flat baking sheet. Sprinkle it with semolina flour (if you have it; if not, use regular flour). Stretch out/shape the dough on a floured surface (countertop works fine). 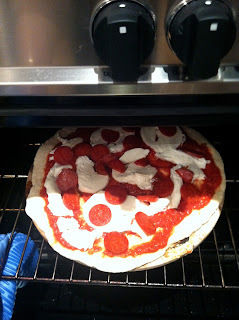 Move the dough to the baking sheet, and then, working quickly, sauce and top it. Now, open the oven and, to make "launching" the pizza onto the stone easier, slide out the oven rack a bit to better access the stone. Now gently slide the pizza from the baking sheet onto the stone. Move the rack back into the oven all the way, close the door and bake. 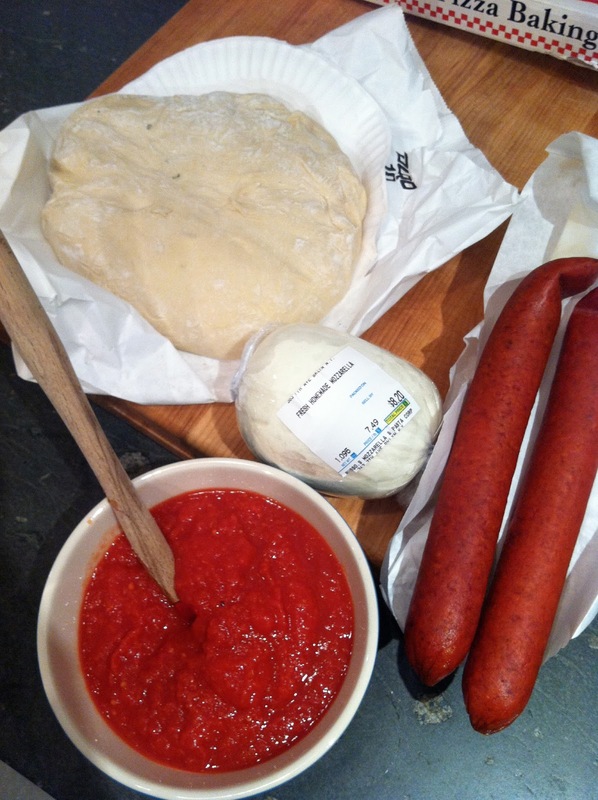 There is so much to learn about making pizza well! I didn't know you were supposed to leave the stone in for so long. And I am definitely incapable of launching a fully topped raw pizza onto a 500 degree baking stone in the oven! Knowing me, everything would fly off the pizza and start smoking the oven immediately. I go between being happily clueless about how to make pizza like a pro and wanting to study hole structure with a magnifying glass.